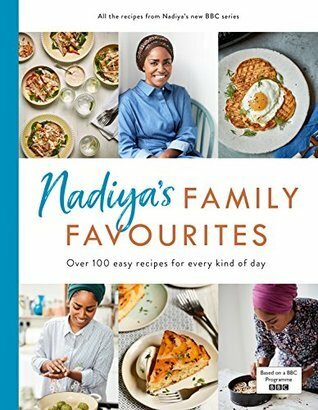 Synopsis: This is the OFFICIAL companion cookbook, featuring the beautiful, simple and must-try recipes from her upcoming BBC TV series NADIYA’S FAMILY FAVOURITES. Here’s a taster of Nadiya’s new classics . . .
Let Nadiya’s recipes fill your home with memories, just as they do hers. This is the way family cookbooks should be. Nadiya’s includes lovely homey little introductions to each recipe that gives them a real comfort food vibe. I especially love her introduction to the book where she discusses her family life around food and how food is a representation of home. The recipes included are very appetising and achievable. In the dessert section, she includes an Éclair Roll and Back-to-Front Baked Cheesecake that are very inventive but not over the top so still within the realms of everyday cooking. I love Nadyia!!!!!!!! Ugh I need this book now! It’s out now you should definitely get it!! I really liked the recipes in the sampler, I’m getting the full cookbook.